In this week leading up to October Unprocessed, I wanted to do a killer giveaway that goes above-and-beyond. I enjoy a good bit of irony, too, so what could be a better choice than a food processor? I contacted my friends at KitchenAid, and they happily suggested their brand-new 13-cup ExactSlice™ Food Processor. The very first ones are just starting to come off the production line! My verdict? This thing is a beast. I mean that in a good way, of course. Upon unpacking it, I was quite surprised at just how big this machine is. It’s clearly designed to be a multi-tasking kitchen brute. The main bowl has a huge 13 cup (3.1L) capacity! Thankfully, it also comes with a 4-cup “mini-bowl” insert — which makes it convenient for smaller recipes, too. Designed to be versatile, it can slice, shred, chop, purée, and even knead. It includes two multi-purpose blades (one for each bowl size), a dough blade, a shredding blade, a slicing blade, and, thankfully, a storage box for all those little parts. What’s really revolutionary (get it?) about this particular food processor is the new “ExactSlice” system. Unlike a typical food processor that may have a couple of different fixed-width slicing blades (if you’re lucky), this one allows you to change the thickness of the slices on-the-fly, without even opening the bowl, just by sliding a lever. You can even adjust it while it’s running. The dual speeds make it easy to control. I especially like how the “pulse” mode gracefully ramps up, rather than just kicking into high-gear right away. Just tap the button and it’ll gently spin a few times around, but hold it down and it’ll come up to full speed in a just a second or two. It also has a 3-in-1 Ultra Wide Mouth™ feeding tube, so it can accommodate large fruits and veggies without much prep work (you’ve still got to wash them, though!). Another thoughtful touch: If you keep all the plungers nested together, the smallest one has a tiny hole in the bottom. To drizzle in oil, or any other liquid, you can just pour a measured amount in the cup and it’ll slowly feed into the processor on its own. Precise and easy. Nice. I had hoped to include some recipes with this post, but I’m a little behind because of all the work in putting together October Unprocessed. Stay tuned, though — soon we’ll be sharing some great recipes that you can make easily in a food processor (I’m thinking in particular about the ones that are far cheaper to make from scratch, like hummus and pesto, and super-easy if you have a food processor!). Okay, so I’m guessing by now I’ve convinced you that this machine is pretty sweet. Enough of my rambling — head over to Amazon to buy yours today! Huge thanks to Rachel, Jessica, and @KitchenAidUSA! 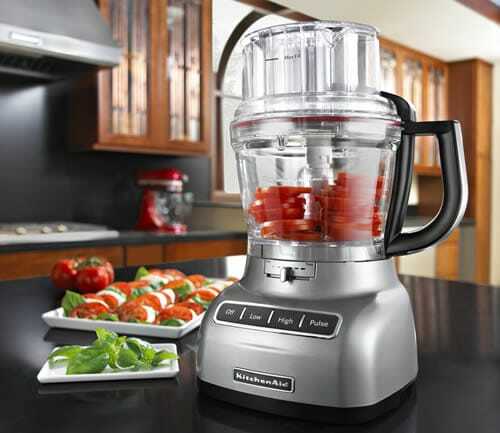 A @KitchenAidUSA Food Processor Giveaway for October #Unprocessed! eatingrules.com/2011/09/kitche… via @eatingrules Fingers are SO crossed on this one! I would absolutely love to win this since I’ve been using my blender for most recipes that ask for a food processor (hummus, black bean burgers, salsas). Lately I have been experimenting with Mediterranean recipes and I would I’d love an upgrade in my kitchen! Wow — that thing is a beauty! I’ve tweeted about the contest :). Thanks. This is so beautiful! I’ve shared it! I would make fresh bread and hummus, and salsa all day. I shared on Twitter! I would make everything in this that you can make in a food processor…I was making almond butter in mine yesterday and burnt up the motor! I have been looking at the KitchenAids for a while now and love them! Great giveaway. I just found your blog and I love it. I am going to commit to October Unprocessed, I love the idea! Tweeted it! I think I would get even more lost in my kitchen with one of these! Hummus…bring on the hummus….